Spotted chained to a pole in SoHo! Lately, I've been doing a lot of baking for spring gatherings and taking my creations on thrifted platters that I can offer as a gift to the host or hostess. But on a recent stop into Goodwill on my hunt for an appropriate serving option, I was distracted by this wooden lazy susan. I mean, how could I not be with a price tag of $3. It needs a little TLC, but here it is sitting atop my Gene Meyer rug in the living room. 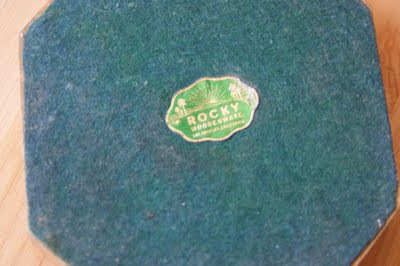 I imagine it's from the 1960s, but can find nothing about the brand, "Rocky Woodenware, Los Angeles, California" that's marked on the label affixed to this piece's green-felt-covered base. 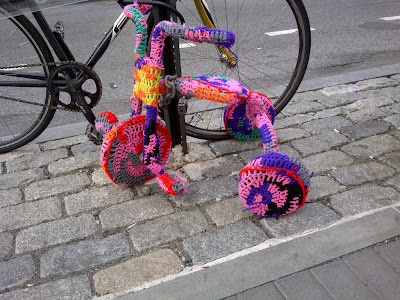 It needs a bit of TLC on its surface but will ready to take a spin at my next festive get-together! I love a good garage sale....one with tables heaped with goodies and surprises bursting forth every where you turn. I've been known to do U-turns in traffic to inspect signs posted on phone poles promising multi-family garage sales packed with treasures. So I had a lot to say when my hometown newspaper, The Independence Examiner, called on me to talk about garage sale etiquette. Read all about it here. As you know, I not only possess the Gift of Thrift, but also the Gift of Gab! As I'm in the process of making changes in my bedroom, and one of the pieces I'm putting away is this shelf I remember from my childhood. It once held our family's volumes of Encyclopedia Britannica as well as other children's books in the corner of our living room in Independence, Missouri. It comes apart easily and can be stacked flat, so one day several years ago, my dad surprised me by lovingly wrapping it up and mailing it to my apartment. I have used this shelf for many years and would never dream of tossing it out. But I had decided it was time to put it away for awhile until I could decide upon its next destination. As I was unscrewing the shelves, I noticed this unusually shaped red outline on the top -- one so familiar that it didn't take me long to remember what had once left its imprint. 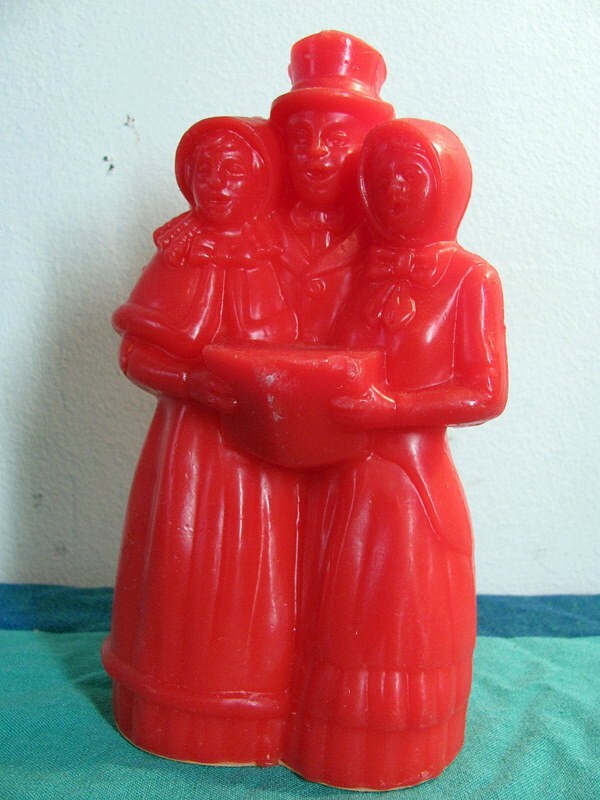 Every Christmas, Mom displays her Avon, scented wax carolers from the 1970s like this one I saw at Dirty Birdies Vintage shop on Etsy. 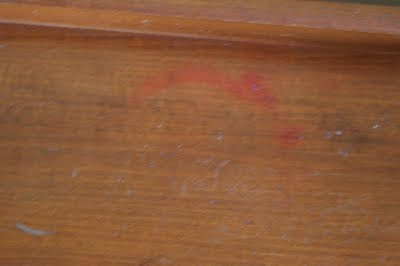 And one Christmas many years ago, Mom must have placed her wax trio on this piece of furniture, since to this day, its melted markings remain on the top shelf. What to do with this gorgeous,vintage origami paper I found for 25 cents at an estate sale in Independence, Missouri? I'll show you tomorrow! When I need a quick pick-me-up, a five-minute dash through a thrift store usually does the trick. I hardly ever buy, since the objects on display never fail to lift my spirits. On this occasion, however, I did buy when I ran across this marvelous Eva Zeisel serving dish in a Kansas City Goodwill. In perfect condition, I paid a whopping $5 for this ensemble. It's safely tucked away at my parents house in Independence, Missouri, and will fly back to New York with me some day in the near future. • And finally, don't be a Thriftzilla. Create good thrifting karma by being kind to the people who are offering their wares, accepting fair prices and leaving a little something behind for the next person. Warm weather signals to me that amusement parks will soon be opening. And in New York, Coney Island ushered in in another season of fun. Here's a sweet treat to get your weekend groove on! Lately, I've been seeing all kinds of thrifty ideas for make wall décor, and this one was in the windows of Atrium right across the street. Not only did the creative folks there salvage an old picture frame for this display, but it also appears that they quite literally reached over to the work bench to repurpose the subject in this piece of art. Hung quite simply without any special matting or extra treatment, this element would fit right into a masculine setting -- or even a workshop or tool shed! So much for being teased with the spring weather now that April's showers have cast a gray haze over New York. To brighten your day wherever you are, here's a funny display that I snapped with my small camera from the windows of Vintage Thrift Shop over on Third Avenue. It's a gem of a destination packed to the ceilings with everything you can imagine, from thrifty knickknacks and lovely ladies' accessories to incredibly tempting vintage furniture finds, and might I add, all at very fair prices. And this scenario with its fearless little mouse making his own major haul is absolutely priceless. The Find: Wrapped & Ready to Go! 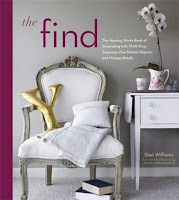 Here's a copy of The Find: The Housing Works Book of Decorating With Thrift Shop Treasures, Flea Market Objects, and Vintage Details all wrapped up for Kathe Fraga, an artist in Bainbridge Island, Washington, who won last week's DesignTV giveaway. Fraga shared a photo of a vintage Goyard trunk that she paid $40, not knowing what she had just purchased, only to find out that it was a treasured, French find. Congratulations! If you have a copy of The Find, email me your information and I'll mail you a personalized bookplate. I ran this post a while back, and this book still tickles me every time I flip through its colorful pages. Among my favorite thrift finds are old entertaining and decorating books that I find and garage sales. You never know what you might turn up -- a Technicolor cookbook filled with improbable concoctions of gelatin and food coloring or tawny toned meats accessorized with pineapple rings or wrinkly tomatoes. Inside the front cover Heloise Cruze is described as a "petite five-two, hundred-twelve, blue eyed kind of hurricane from Texas [who] measures 34-27-34." "The naturally attractive and vivacious Heloise loves color. She finds release from her work in painting, and her closet-full of muumuus covers the spectrum. Heloise works the way she talks -- fast and often, also plays an electric organ." January 5: "Keep dustpan waxed. Dirt will slide off it much more easily than an unwaxed one." April 4: "Don't forget that the idea of making smashed cheese sandwiches, wrapped in foil and ironing them, with an electric iron is fabulous." July 8 "Don't keep your husband in hot water all the time because this will not make him tender." "When preparing hamburger meat, shape it to look like a weiner. Then cook it the same way as ordinary hamburgers and serve on hot dog rolls." Reuse & Repurpose: Frame It! 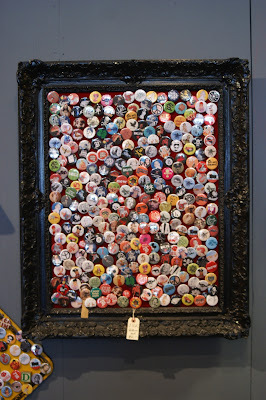 Here's a novel way to show off a collection and at the same time re-use an old picture frame, an object so common in thrift shops and often over looked because of the art inside it or the state of the glass that covers it. 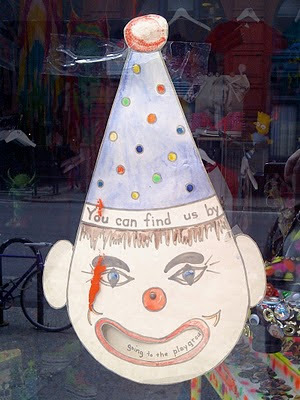 I saw this piece at Enamoo, a gift shop in downtown Brooklyn, while on a springtime stroll there a few days ago. You could take any frame and if needed, remove its glass and secure its corners with wood glue. Let the glue set, give it a quick coat of paint, let it dry, and finally tack a piece of fabric-covered foam core to its reverse. Voilà: a palette on which to display a lightweight collection. 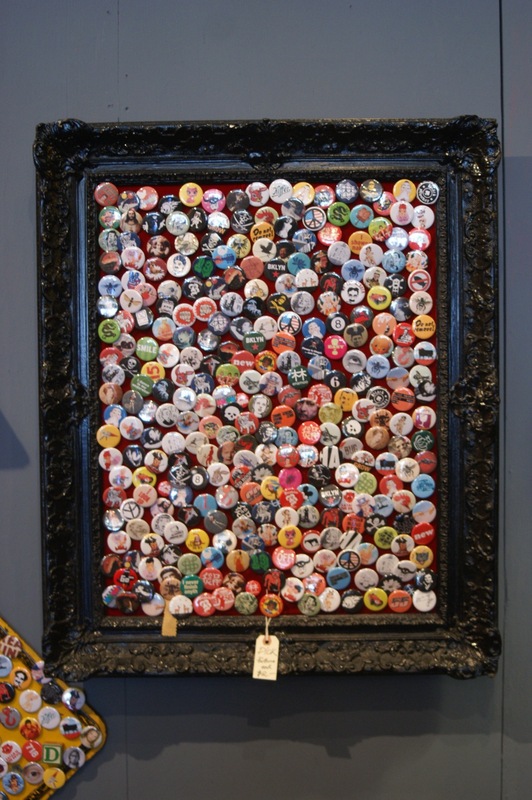 You could create an eye-catching display of colorful earrings, special photos, favorite postcards or buttons, just like they did here, and show them off for everybody to admire. I may do a lot of thrift shopping, but unless I'm looking for something specific, I actually buy very little and take home most of my memories in photographs. This kissing Dutch couple on the street in front of Yesterday's News in Carroll Gardens, Brooklyn, were awfully cute, reminding me of all the lawn ornaments my sister and I admired as a kids. With the exception of a bird bath, our own yard was fairly minimalist, and any decoration was left to all the plants and flowers that populated the outdoor space. So I left this springy duo right where I saw them, since I couldn't imagine where in my New York apartment I would put them. And can you imagine watching me haul them home on the subway? A Goyard trunk will get you anywhere -- or at least a copy of The Find: The Housing Works Book of Decorating With Thrift Shop Treasures, Flea Market Objects, and Vintage Details for Kathe Fraga, who won last week's DesignTV giveaway. Contestants were asked to post their favorite finds on DesignTV's Facebook page, and Fraga's fabulous trunk was a clear winner. Fraga, an artist based in Bainbridge Island, Washington, said she paid $40 for this wardrobe a few years back and had no idea it was such a coveted French brand. "I remember opening it up and seeing the distinctive bright yellow interior," Frage said. "At the time, I have to admit, I thought it was a joke. Bright yellow in such a beautiful piece? I thought it was a re-do." But after a little research she realized that the interior's exuberant hue was a trademark of the luxury bag maker. Next, she felt compelled to learn about this mysterious trunk's owners. . A tattered piece of masking tape held the first cues, and when she matched them to the faded initials on the trunk, she eventually discovered that it belonged to Rosemary Cooper McCone (R.C.MC.C), the wife of John A. McCone, head of the CIA under President John F. Kennedy. The couple married honeymooned in Paris in 1938, where the iconic trunk was made. "That's the fun part of collecting vintage," Kathe says. "Go with what you love, and you never know what'll happen! 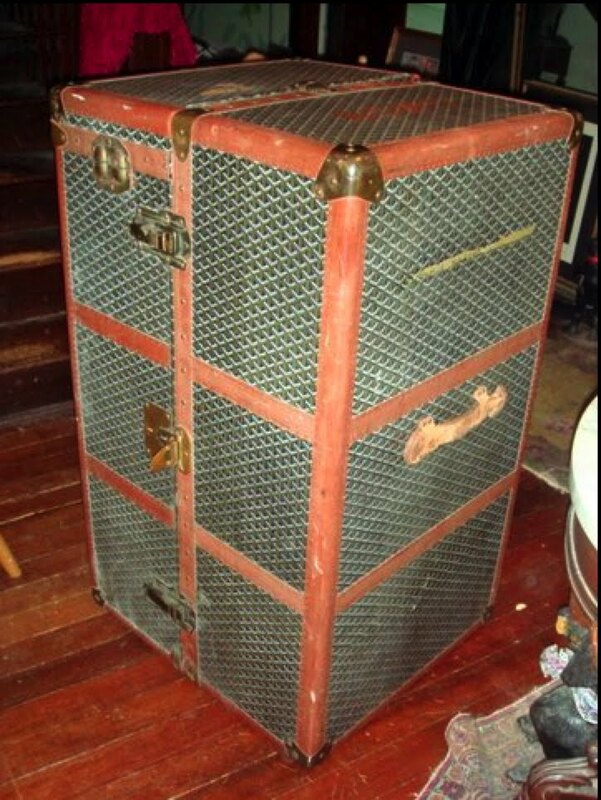 And the next time I spot a Goyard trunk, I'll know better than to question the interior color choice!" Congratulations, Kathe! I'm wrapping up a special copy of The Find and dropping it in the mail just for you! If there's one thing at a garage sale or a flea market that can capture my attention for hours, it's a tempting pile of postcards or an enchanting plate filled with old greeting cards just begging for my attention. I can literally spend hours sorting through every card, picking out examples that hold special significance, either reminding me of someone to whom I might owe a note or possibly a favorite destination. While I enjoy looking over the messages that written on these cards' reverse sides, I only buy those that have not been used so I can add my own note, affix a stamp and pop it into the mailbox for a heartfelt, vintage surprise.